Structurally deficient civil engineering infrastructure: Concrete, metallic, masonry and timber structures; Fibre-reinforced polymer composites used in rehabilitation; Surface preparation of component materials; Flexural strengthening of reinforced concrete beams with fibre-reinforced polymer composites; Shear strengthening of reinforced concrete beams with fibre-reinforced polymer composites; Strengthening of reinforced concrete columns with fibre-reinforced polymer composites; Design guidelines for fibre-reinforced polymer strengthened reinforced concrete structures; Strengthening of metallic structures with fibre-reinforced polymer composites; Strengthening of masonry structures with fibre-reinforced polymer composites; Flexural strengthening application of fibre-reinforced polymer plates; Durability of externally bonded fibre-reinforced polymer composite systems; Quality assurance/quality control, maintenance and repair; Case studies. The repair of deteriorated, damaged and substandard civil infrastructures has become one of the most important issues for the civil engineer worldwide. This important book discusses the use of externally-bonded fibre-reinforced polymer (FRP) composites to strengthen, rehabilitate and retrofit civil engineering structures, covering such aspects as material behaviour, structural design and quality assurance. The first three chapters of the book review structurally-deficient civil engineering infrastructure, including concrete, metallic, masonry and timber structures. FRP composites used in rehabilitation and surface preparation of the component materials are also reviewed. The next four chapters deal with the design of FRP systems for the flexural and shear strengthening of reinforced concrete (RC) beams and the strengthening of RC columns. The following two chapters examine the strengthening of metallic and masonry structures with FRP composites. The last four chapters of the book are devoted to practical considerations in the flexural strengthening of beams with unstressed and prestressed FRP plates, durability of externally bonded FRP composite systems, quality assurance and control, maintenance, repair, and case studies. 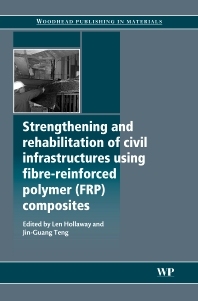 With its distinguished editors and international team of contributors, Strengthening and rehabilitation of civil infrastructures using fibre-reinforced polymer (FRP) composites is a valuable reference guide for engineers, scientists and technical personnel in civil and structural engineering working on the rehabilitation and strengthening of the civil infrastructure. Len C. Holloway is Professor of Composite Structures at the University of Surrey, UK and Visiting Professor in the Department of Civil and Environmental Engineering at the University of Southampton, UK . Professor Jin Guang Teng is Associate Vice President, Dean of the Faculty of Construction and Land Use, and Professor of Structural Engineering at The Hong Kong Polytechnic University, China.